Hey ladies! Do you like misanthropic, millionaire pharmaceutical CEOs that price gouge people suffering from strange illnesses? 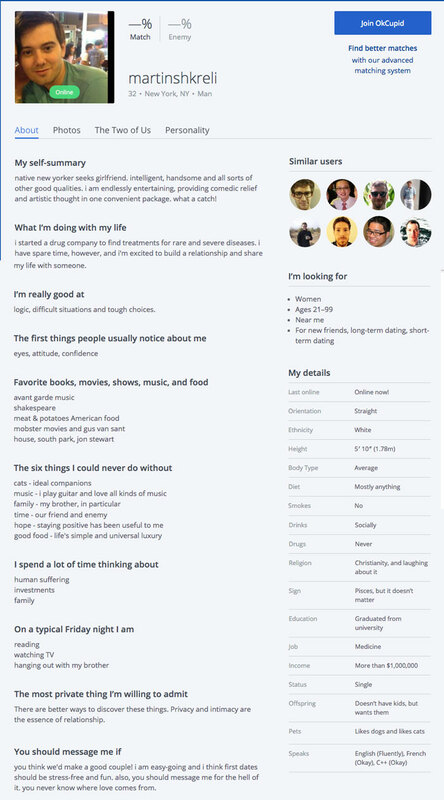 Then check out the OK Cupid profile of Martin Shkreli! You may know Shkreli as the guy whose company purchased a medication that fights opportunistic infections in people with weak immune systems and raised its price 5000 percent. But if you play your cards right, he could be your new boyfriend!!! Haaaaay! – He calls himself “a catch.” Any guy who calls themselves a catch has to be a catch, right? Otherwise it’s a lie, and everyone knows that real catches don’t lie. – “I’m really good at logic, difficult situations and touch choices.” Except when it comes to defending my business decisions, in which case I go on live TV and act like the Reptile King or go on Twitter and quote Eminem. – Favorite shows: Jon Stewart – Yes, Shkreli likes Stewart so much that he’s did the sort of thing that would get him mentioned on The Daily Show, haha. – Six things I could never do without: cats… Better not hang out with too many cats though, because if you do, you could get toxoplasmosis and not be able to afford the treatment. – I spend a lot of time thinking about human suffering… specifically how to cause it for maximum profit. He’s all yours, ladies. Although he inexplicably took down his profile as of September 21, 2015. Awwwww! Maybe he was getting too much attention. He is, after all, a catch. He’s also a League of Legends player, if you’re into that.